In a pressure cooker pour 500ml of water, heat for 2 minutes and add oil. 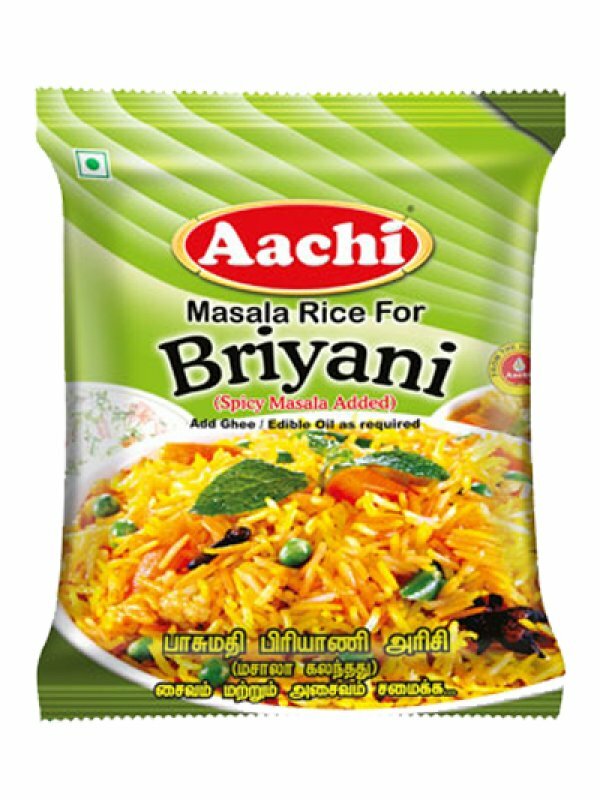 Add 200g Aachi Masala Rice for Briyani followed by 250g cleaned and cut vegetables/ half boiled meat. Add few coriander leaves and allow it to boil. Pressure cook till 2 whistles. Top the rice with ghee, blend well and serve hot. No need to add salt. Basmati Rice, Bay Leaf, Salt, Edible Vegetable Oil, Cinnamon, Mace, Cloves, Cardamom. Basmati Rice, Bay Leaf, Salt, Edible Vegetable Oil, Cinnamon, Jathipathiri, Cloves, Cardamom.